1. A 5 cm incision was made in the upper midline and omentectomy is initiated through this small incision using a mini-retractor (Kent Retractor TKZ-F10328-D5; Takasago Medical Industry Co Ltd., Tokyo, Japan). 2. A 12 mm trochar was inserted below the navel for a laparoscope. A 5 mm trochar was inserted in the upper right abdomen for a snake retractor to pull up lateral segment of liver, and a snake retractorfs holder was used for this trochar site. A 12 mm trochar was inserted in the upper left abdomen for operatorfs right hand. An abdominal wall sealing device (the Lap Disk) was used for a 5 cm incision and a 12 mm trochar was placed through Lap Disk for operatorfs left hand. 3. Under laparoscopic view, additional dissection for omentum and lymph nodes along the right gastroepiploic vessels and left gastroepiploic vessels were made, and the stomach was lifted from the pancreas. The lesser omentum was cut with preserving the hepatic branch of vagus nerve. To obtain better and stable surgical view, a taping technique for the stomach body was developed for this procedure. The left gastric vein and artery was divided after double-clipping safely under a very nice surgical view by the taping technique. The dissection of the lymph node along the left gastric artery was made. 4. Through a 5 cm incision, the stomach was cut using linear stapler at the oral excision line. 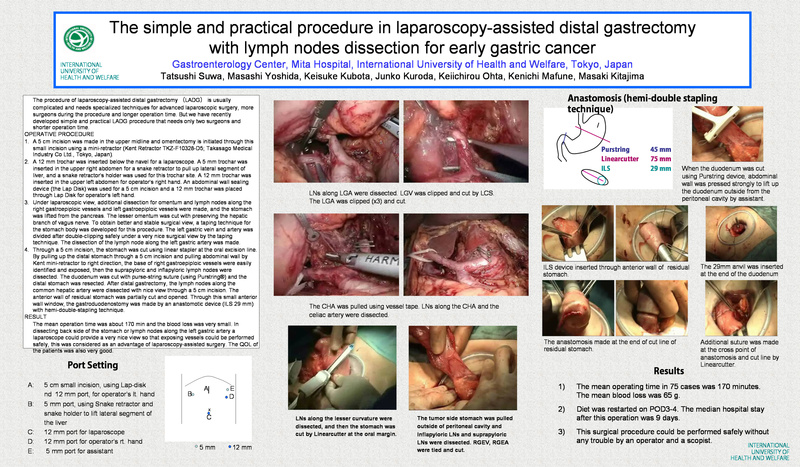 By pulling up the distal stomach through a 5 cm incision and pulling abdominal wall by Kent mini-retractor to right direction, the base of right gastroepiploic vessels were easily identified and exposed, then the suprapyloric and inflapyloric lymph nodes were dissected. The duodenum was cut with purse-string suture (using Purstring®) and the distal stomach was resected. After distal gastrectomy, the lymph nodes along the common hepatic artery were dissected with nice view through a 5 cm incision. The anterior wall of residual stomach was partially cut and opened. Through this small anterior wall window, the gastroduodenostomy was made by an anastomotic device (ILS 29 mm) with hemi-double-stapling technique. RESULT – The mean operation time was about 170 min and the blood loss was very small. In dissecting back side of the stomach or lymph nodes along the left gastric artery a laparoscope could provide a very nice view so that exposing vessels could be performed safely, this was considered as an advantage of laparoscopy-assisted surgery. The QOL of the patients was also very good.